The horror that is kids in cars. Because once you are doing the daycare or school run twice a day, all of the below behaviours will begin to manifest in your children whenever they get near the car. I don’t know what it is about kids and cars but for some reason as soon as they are seated in the car, their pockets explode with sand, rocks, lint, tissues, half-sucked lollies and five cent pieces in the same way that a clown’s pockets explode with confetti. If I know one thing about kids and cars, I know this: when it’s time to get in the car, kids become very single-minded about rattling the handles of the locked doors as if that’s what makes the car unlock. Ultimately this means you will spend a lot of time standing in shopping centre car parks yelling “Don’t touch the doors! Don’t touch the doors!” while your kids go at the doors like a bunch of rioters trying to roll the car onto its side. For adults, it’s just a given that if you fart in a car, you wind down the window so as not to asphyxiate either yourself or your fellow passengers. Kids on the other hand, like to blow off and then let everyone stew in the fart-y miasma. This is my kids’ favourite trick: the water bottle that rolls around when they’re gone. So, I’m driving along by myself and then every time I brake or go around a corner, something rustles. I stop to see what it is. Nothing. I take off again and there it is AGAIN! What is it? A rat? A psychopath with an axe? WHAT IS MOVING AROUND IN THE BACK OF MY CAR AND IS IT ABOUT TO CRAWL OVER ME OR KILL ME? I MEAN, WHAT IS THAT AND HOW DOES IT KNOW TO STOP MOVING EVERY TIME I STOP THE CAR???? 5. Doing things that need to be seen to be believed like, right now, turn around now! Once you are driving in heavy traffic, your kid will suddenly need to show you something RIGHT NOW!! RIGHT NOW MUM! LOOK AT THIS! LOOK! Spoiler alert: it won’t be worth crashing the car for. It won’t even be worth turning around for in my experience. Modern vehicles have a lot of bells and whistles and a kid’s life ambition is to fiddle with anything that isn’t moulded in place until it breaks: retractable cup holders, ashtray and lighter fittings, the glovebox, the pop-up lid on the middle console, electric windows, and seat head rests that (surprise, surprise!) detach completely. I had a middle console compartment with a lid that conveniently popped up when you pressed down lightly on the latch. It was so “convenient” that my kids couldn’t stop popping it. Every time. Every time. Every time. Finally the latch was so overworked it lost its ability to stay shut. Which meant it would suddenly pop up every time we went over a bump or braked at the lights. It was like driving around in the Herbie Goes Bananas car. Say “bye-bye” to pristine seat upholstery and the re-sale value of your car because that entire back seat is now just a portable napkin for your kids to wipe their grubby hands on. The back of the passenger seat is a super-absorbent face cloth and the window is for checking that they still have fingerprints. Repeat until the window is covered in fingerprints. This will include: throwing their body into the car sideways and leaving their feet hanging out, going in or out through the open window “Dukes of Hazzard” style, clambering in or out via the driver’s seat because … convenient, and my personal favourite: going in or out through the hatch between the boot and the back seat because … just because they got wedged in the hatch last time doesn’t mean it will happen again this time. 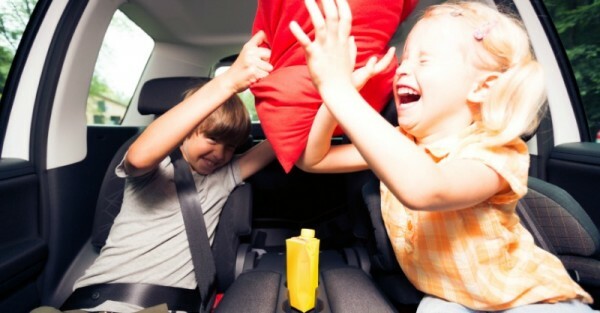 In addition to the exploding pocket phenomenon your kids will also wedge disgusting things into the seat cracks, slip things into the back-of-seat pockets and deposit melting perishables in any other inviting nook of the car door that is designed to “hold things” that people might need later. Spoiler alert: these will not be anything that needed to be kept for later: the lolly they didn’t like the taste of that is now covered in dog fur, a melted Smartie that has now fused to the car door handle, last month’s apple core now petrified or three overcooked chips from last holiday’s Happy Meal. Once you have kids, it’s best to take a “Don’t look, don’t tell” sort of approach to the backseat of your car. Twice a year, take it to the car wash and hand over the keys for a full service interior and exterior cleaning job. Just keep your eyes on the road and don’t look back, ever.